A search for hope began with a viewing of the 2014 film, Interstellar, the mind-stretching movie directed by Christopher Nolan, and written by Christopher and his brother Jonathan Nolan. 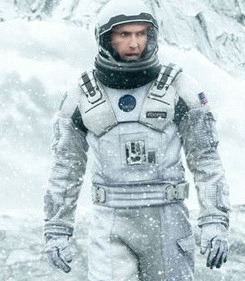 Interstellar is one of those motion pictures that lifts the spirits because it brings hope to human experience. After viewing the nearly three-hour Interstellar, I came across Louis Menand, a writer who cuts through the miasma of contemporary politics by carefully observing the past. For contemplation during this nation's Independence Day week , The New Yorker chose to publish a collection of Menand's essays, starting with his story of the dramatic and long-delayed passage of what became the 1964 Civil Rights Bill. "Most Americans who made it past the fourth grade have a pretty good idea who Thurgood Marshall, Rosa Parks, and Martin Luther King, Jr., were. Not many Americans have even heard of Alice Paul, Howard W. Smith, and Martha Griffiths." This trio played significant roles in the history of women's rights. They opened the way to equal economic opportunity. Nearly all the gains women have made in that area since the passage of that 1964 bill may be attributed to them. What was peculiar about the achievement of Paul, Smith and Griffith, Menand explains, is that equality for gender became law only after it was slipped into a Civil Rights Bill drafted primarily to achieve equal rights for African American men and women. The addition of "gender" to that Bill, "was accomplished in the face of the unequivocal opposition of the liberal establishment." (The Menand essay should be read in full to appreciate the political machinations that led to the bill's final passage.) 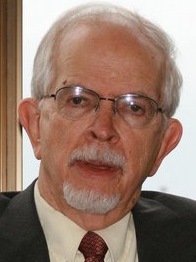 In his essay, Louis Menand focuses on the equality for American women in the workplace. I choose to go a step further and focus on the gross inequality of citizenship between Israelis and Palestinians. If that sounds familiar, it should, because it is that same liberal establishment that has aided and abetted the state of Israel in its murderous military occupation of the people of Palestine since 1947. This reluctance extends to punishment of any entity which stands in the way of the military dominance of the American empire. 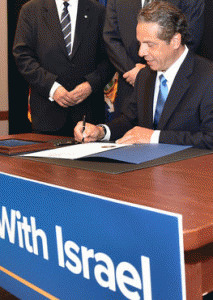 Ask New York Governor Cuomo (below) why he signed an anti-BDS executive order in New York City, June 5, with Ido Aharoni, the Israeli consul general, standing behind him. "If you boycott against Israel, New York will boycott you. If you divert revenues from Israel, New York will divert revenues from you. If you sanction Israel, New York will sanction you. Period." Menand examines the 1964 Civil Rights victory and points to it as a classic case of what the philosopher Frederich Hege l called "the cunning of reason, the way apparently random or anomalous events later turn out to be pieces in a larger historical design." Be forewarned Governor Andrew Cuomo, Hillary Clinton and Donald Trump -- there is a "larger historical design" at play and you are each building a personal case of political cowardice which will judge you and your fellow establishment leaders when that "design" emerges in full view. "God moves in a mysterious way; His wonders to perform; He plants His footsteps in the sea, and rides upon the storm." Cowper's words are his own, though they are often mistakenly attributed to the New Testament.